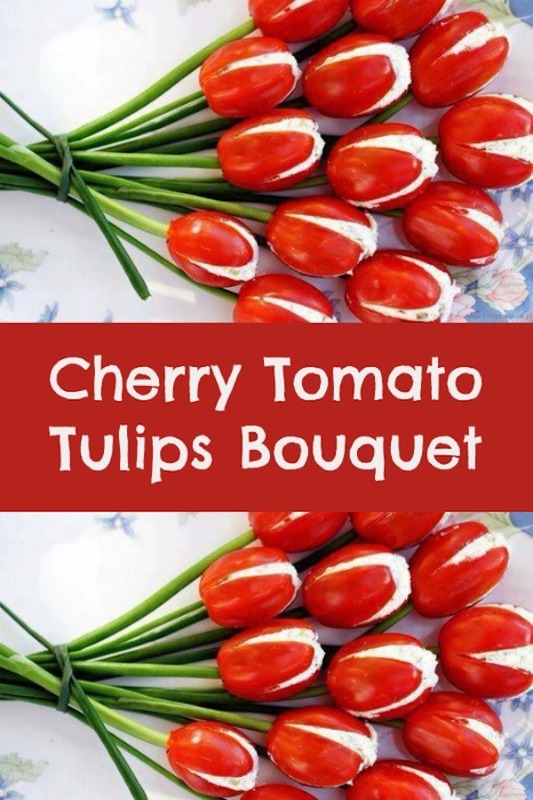 Cherry Tomato Tulips Bouquet. What a creative and healthy fun food idea that also looks so pretty at the dinner table. This beautiful bouquet is also a delicious appetizer that goes really great at any party of gathering. 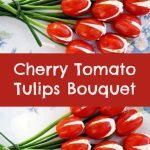 This Cherry Tomato Tulips Bouquet would be a great recipe for Valentine’s Day, or to celebrate mom with a beautiful bouquet on Mother’s Day. This is really a super easy and fun appetizer. Make it at home and it is also a great way to get your children to eat more veggies. Give it a try and let me know how the recipe turned out for you. I am sure everyone would love it. Cherry tomatoes are delicious and stuffed with cream cheese….even better! Impress your guest or family with this super fun appetizer idea. It is easy to make and looks so beautiful at the dinner table. If you are interested in other easy to make creative and healthy fun food, please check out my post Healthy Snack Ideas or for more recipes with tomatoes please see Caprese Salad Kabobs. My recipes are easy to make and I try to incorporate as many healthy ingredients as possible. Looking for more Valentine’s day fun food? Please see one of my favorite and easiest recipes, Mind-Blowing 3 Ingredient DIY Chocolate. It really only uses 3 healthy ingredients, takes 5 minutes to make, and the chocolates are out of this world! Remember to use fresh and quality ingredients always. Make as many as you want. They are so delicious and look so pretty! A beautiful appetizer idea that is healthy and delicious. Grate or finely chop the cucumber. Add the cheese and basil. Season with salt and pepper to taste. Make sure to mix all ingredients really well. Cut a cross shape on the top of each cherry tomato. Make holes for the stalks at the bottoms of the tomatoes to insert the stalks of chives later. Fill in tomatoes with the mixture of cream cheese, cucumber and spices. Stick these on the stalks, place on a plate and tie it with a stalk. I am a reporter at NBC Owned Television Stations. Could I use your photo in our Mother’s Day DIY roundup online? Hi, the photo is not mine. I got permission to copy the idea from Facebook so I see no problem if you use it too. Hi, Sorry! I tried the recipe with both but I like it better with cream cheese! I will correct the mistake 🙂 Thank you!